The next “Ostensions” will be held in 2016 and you are invited. We have already begun to prepare the next “Ostensions”. The practical organisation will begin in 2014 and it will not be too soon to get ready. You are invited from now to join the participation for the manifestations of the “Ostensions” in 2016 and, in order to give you a better idea, you can find some photos and commentaries of the event in 2009. Every 7 years, the population brings to life the procession and the exposition of the relics of their patron St. Leonard, just as they happened for the first time in 1094 and permitted the healing of the sick caused by the plague called “Le Mal des Ardents”. All the inhabitants got together in a combined effort between all the different people, believers or not, in order to decorate the town and to welcome the visitors and pilgrims. It’s the opportunity to welcome the many delegations who come from Europe and Africa, from the towns and parishes named “Saint Leonard”. In 2009, during the last “Ostensions”, a crowd of over 10000 people came to take part in the event. The Ostensions of Saint Leonard brings to life, every seven years, a Christian festival which has been in existence for more than a thousand years. This is a festival which commemorates the ostension of the relics of the Saints of the Limousin, which cured the « mal des ardents » (the malady of the fevered) . 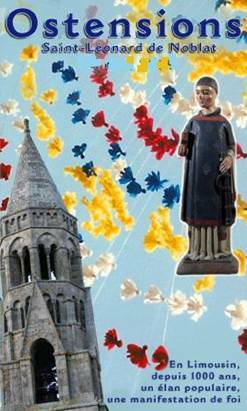 The town of Saint Léonard- de-Noblat is in fête, covered in garlands of flowers and banners , and a large crowd follows the passage of the relics of the Saint as they pass in procession. Saint Leonard who is represented wearing a chasuble decorated with fleurs de lys, at the head of the procession. The prisoners and famous pilgrims, who hve come here throughout the centuries, surround him , dressed in the costumes of their day. After the delegations come the representatives of the Limousin Confraternities, among which is the Confraternity of Saint Leonard, each of whom carry the reliquary caskets containing the relics of their Patron Saint. They are followed by the parishoners of the 12 villages which make up the parish of Saint Léonard en Limousin. The clergy bring up the rear of the procession. All the spectators share in the enthusiasm. Everyone remembers the life of Saint Leonard and his devotion to those who were prisoners and victims of maltreatent of all sorts, and they continue to give him their confidence, today. May these ostensions help to create a durable link between all those who experience these moments of spiritual communion. You presence will give us great pleasure. We shall be delighted to welcme you to our town to celebrate its founding Saint. We need to remember and celebrate those men shaped by the gospel and particularly Saint Leonard who devoted his life to the deliverance of prisoners. Yes, feel very welcome to take the road with him, our world has great need of liberation. 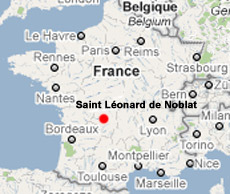 Our town of Saint Léonard-de-Noblat, nestled in the heart of the land of mountains and dams owes a great deal of its renown to its founder, the hermit Leonard. This is a tourist site which is celebrated for its remarkable mediaeval architecture. Saint Léonard-de-Noblat can be seen from many kilometres all around thanks to the bell tower of its 11th century Collegiate Church, which is designated a U.N.E.S.C.O. 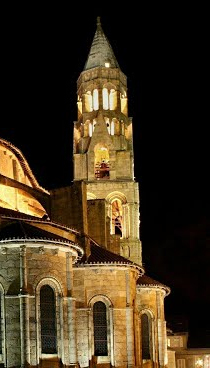 World Heritage Site as part of the pilgrimage route to Santiago de Compostella. The « Miauletous » (the inhabitants of Saint Leonard)as we are called, no matter to which generation we belong, remain attached to the many local popular festivals, which mark the life of our city. It is always with great pleasure that we mark our calendars each year with festivals from the Quasimodo to the Quintaine as well as that of Saint Martial and the septennial Ostensions. All these gatherings bring us together in a real spirit of soldarity, and help to develop our wish to share these with all who visit us. We also have the desire to make our city even more beautiful and more welcoming. It is in this fashion that our city, already blessed with its historic patrimony, both architectural and cultural,involves itself in the Limousin Ostension tradition which will take place on the 24th of May 2009.